This App is build to give you comfortable access to flashcards, pendrives and other USB mass-storage-devices like Pixi, Pre or Veer which are connected via an USB-OTG-cable, an USB-Y-cable with an additional powersource and a bus powered USB-hub to your TouchPad. Mandatory for this App is the BASH ("Bourne Again Shell") you have to install from Preware, otherwise the installation will fail. The install-program adds an UDEV-automount-rule, a mount-script and a ntfs-driver as root to your device, which recognizes when you plug in an USB-device, mounts it to /media/internal/usb/... and starts the App to show all (already) connected devices. With the App devices are mounted automaticly if you connect them to your USB-hub, you can comfortable unmount the devices with a wiping gesture and touching on the [ i ] you get detailed informations about the connected device. If you want to attach a webOS-device, you have to make sure to put it into 'USB-drive'-mode within 60 seconds, otherwise it will not be recognized and will not be mounted! The App also shows you CIFS/SMB-shares, that you mounted with Nelsun's "Network Drives"-App, you can unmount these shares and optionally the shares are remounted as "rw" that you get write-access to them. To get access to the data stored on the mounted USB-devices, you need "Internalz Pro" from Preware, where you have to enable "Show hidden files" in the settings. 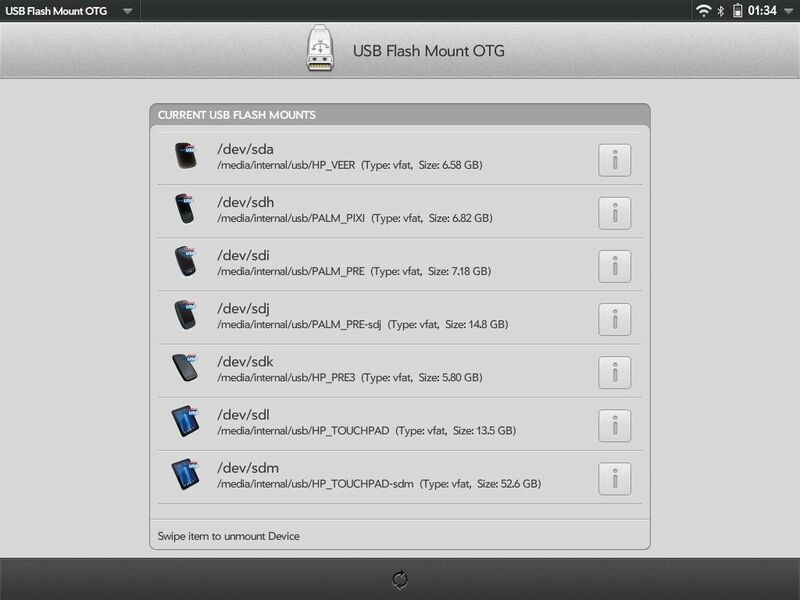 Optional the devices are mounted into the jail-environment of some Apps, that you can access them directly from there. The last line sometimes is not fully printed, just press "refresh" to correct. If connecting an USB-hub with several devices inserted, they will be shown twice, just press "refresh" to resolv. Insert SD-, MS- and other flash-cards into the USB-card-reader before connecting it via USB to the TouchPad, otherwise the UDEV-automount-rules will not recognize them. I found no way to change this, because the UDEV-subsystem of the webOS-kernel seems not to be able to see, if you plug in a flash-card in an already connected USB-card-reader. Optimized the code and removed some debug-code, still beta-code, so errors "included", but now there is less debug-output in the logs.